He was born in an obscure village, the child of a peasant woman. where He worked in a carpenter shop until He was thirty. Then for three years He was an itinerant preacher. He never wrote a book. He never held an office. He never had a family or owned a house. He didn't go to college. He never visited a big city. from the place where He was born. He did none of the things one usually associates with greatness. He had no credentials but Himself. when the tide of public opinion turned against Him. and went through the mockery of a trial. He was nailed to a cross between two thieves. the only property He had on earth. He was laid in a borrowed grave through the pity of a friend. and the leader of mankind's progress. that was no bigger than a football field? Who was this man... Jesus Christ? FJESUS CHRIST WAS FULLY HUMAN. FJESUS CHRIST WAS TOTALLY GOD. BIBLE show us clearly that Jesus was the "God-man". Let's start by looking at the fact that Jesus Christ was fully human. ways to God the Father (Mark 13:32; John 14:28) while still being God Himself. 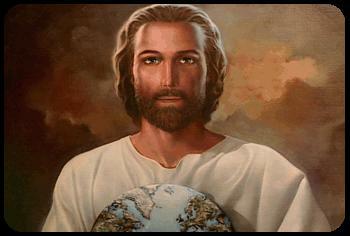 Now, let's look at the fact that Jesus Christ was GOD. worthy of death or worthy of worship. Was He God, or was He a total imposter? ALL-POWERFUL, EVERYWHERE at once, and ALL-KNOWING. How about Jesus? "And he...rebuked the wind, and said unto the sea, Peace, be still. THY SINS BE FORGIVEN THEE. man, Jesus was the appropriate sacrifice. As God, He was the acceptable sacrifice. Q: Why did Jesus need to be 100% human? A: To be the sacrifice for our sins! Q: Why did Jesus need to be 100% God? A: To be the PERFECT sacrifice for our sins! Now that we know WHO Jesus Christ was. . .
WHY DID HE COME TO EARTH? AT THE AGE OF 12. . .
AT THE AGE OF 30. . .
Now it was time to take care of His Father's business. . .
with His message. . .
JESUS CHRIST WAS BORN TO DIE! suffered the pain at Calvary for OUR SINS! and even blue eyes -- this is wrong. picture him with SHORT hair. from age 12 (Luke 2:42) to age 30 (Luke 3:23). 13:55) and so was Jesus (Mark 6:3). DID JESUS HAVE OTHER BROTHERS AND SISTERS? Jesus Christ was clearly virgin born of the young Jewish woman, Mary. a normal marriage with children after the birth of Jesus in no way minimizes His virgin birth. Young's Analytical Concordance to the Bible by Robert Young, LL.D. Calvary, the place where man executed God! We will go to "the place of the skull"
reveal answers to such questions as . . .
WHY DIDN'T GOD THE FATHER WATCH THE FINAL MOMENTS OF THE EXECUTION OF HIS SON ? WHY COULDN'T JESUS HAVE BEEN STRANGLED, DROWNED OR SUFFOCATED? WHAT DOES MOSES AND THE PASSOVER LAMB HAVE TO DO WITH CALVARY? CAN MOUNT CALVARY STILL BE LOCATED TODAY? DON'T MISS IT! TAKE THE CHALLENGE! !